What makes a millennial want to come to work for you or not? It’s a question worth considering when more than one-in-three American workers today are millennials. As I shared in part one in this two-part series, attracting millennials starts with the right environment. 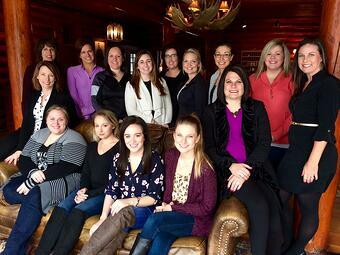 That includes mentoring, like these Marco women leaders do each month with our female millennial team members (pictured to the right). But first you have to capture their attention. While we recognize the benefits of having generational diversity in our workforce, we are specifically referring to millennials for the purpose of this blog. Currently, about a third of the Marco team is under the age of 35. Contemporary employees help us be a contemporary employer. Logically, all millennials are going to be on the front end of their career. So during the interview process, the career path discussion becomes an important element of their decision in choosing a company. We try to give them clear, real-life examples of millennials in our company and the younger people in leadership positions at Marco. We have become more intentional about outlining career paths and continuing to provide advancement opportunities. What does a career path look like at your company? When looking for a position, millennials will size up the organization’s leadership. They want to feel like they can relate to the management of the company and genuinely be able to connect with them. I try to stay contemporary through how I dress, how I interact on social media, how I use current technology and tools, the events I go to and even the words I use. Millennials can easily spot if you’re keeping your saw sharp as a leader – or falling behind. Do millennials want to hang out with you and your leadership team? I think it’s fair to say that all workers want an element of flexibility, and millennials actually view it as a workplace benefit. This is an opportunity for you to offer a flexible work schedule that attracts all people, but has even a greater appeal to the younger generation. Work-life balance is a core value of ours at Marco and millennials appreciate that. How are you creating flexibility? While walking through your facility for an interview or tour, millennials pay attention to the surroundings and technology that is being used. When we give a tour of our company, we view this as an opportunity to highlight us as a contemporary organization. There is also the online component – this might even be more significant. What is your strategy for Facebook, Instagram, LinkedIn, Twitter or Glassdoor? Millennials want to see your organization using the tools they use personally. What do they see when they Google your company? Even though Marco has been in business for almost 45 years, I think we’ve aged pretty well. The qualities that attract millennials are the same qualities that make any organization better. There’s no better time than the present to attract the leaders of your future. Please share what you’re doing to attract millennials to your workplace.